The Precor 833 is a durable, low-impact, commercial-grade treadmill equipped and built to withstand the repetitive, rigorous workouts of health clubs, hotels and spas around the world. 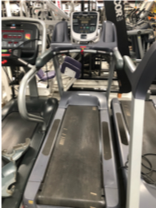 This treadmill has earned its reputation because of the quality and durability which helps provides a dynamic and rewarding workout to its consumers . Rear deck hinges and front cushioning creates a laterally stable platform to reduce shock to runners and provides a firm push off. The deck and belt require no maintenance or lubrication while the steel tapered rollers keep the belt centered to reduce maintenance and noise. 25 preset workouts provide a wide variety of options. Console displays speed, incline, distance, pace, average speed, calories, heart rate time elapsed, time remaining, % complete, time in zone, cals/min, cals/hr, watts, METS, target HR, average HR, elevation gain, workout summary. Touch heart rate sensors are located on the handlebars for increased accuracy and ease-of-use by exercisers of all sizes.